A different take on zombies! I chose this book to read/review because I adore Courtney Summers, and I am so glad that I did. Not only is it about zombies, which is scary, but Ms. Summers puts her own unique spin on the story that makes it a hard book to put down. The characters are multi-dimensional, and I enjoyed reading about all of them. The main character is Sloane Price. The books starts off with Sloane contemplating suicide. At first I was like "wait a minute, isn't this book about zombies?" Sloane lives with her father, and he is not what you would call a "good" father. He is very hard on her, and her sister, Lily. Lily just up and left 6 months ago because she couldn't take it anymore. So, naturally Sloane is bitter and no longer wants to be in the house alone with her father. However, when the zombies invade, Sloane finds herself taking shelter in the local high school with 5 other students. Each student is struggling with his/her own battles, while they all struggle to be a team and stay alive. I loved how the story is about a zombie apocalypse, however the characters take center stage. I really felt the book revolved around what each character was dealing with in his/her life, while the zombies loom right outside waiting for them to make a mistake. I found the book both thought provoking and intense. I found it hard to put this book down, as I did with her previous books. I cannot wait to see what she has in store for us next! In the only way she could...heartbreaking and emotional. I finished reading this right before the season premier of the second half of the 5th season of Walking Dead. Which, if you saw it, was freaken horribly amazing and terribly sad. I love zombie anything, so when I found out one of my favorite authors was writing a "zombie" book, I was stoked as hell. But this isn't a "zombie" book as it's more a "people" book surrounded by zombies. A story I finished mere hours after I started it; to call This is Not a Test by Courtney Summers gripping would be an understatement. The world has ended or at least it seems that way, for unknown reasons the dead have risen and they are seeking out the living, to kill them, to eat them and with every bite more dead rise. In Sloane Price’s mind, however, the end of the world is exactly what she needs. While the group of fellow students, Sloane finds herself barricaded with, try their best to stay alive Sloane prays for the dead to come bursting through the doors to take her and end her life. Because ever since Sloane’s older sister Lily abandoned her to escape their abusive father, Sloane can’t see what there is left to live for especially now that the rest of the world is joining the dead. This is Not a Test is an intense and heart twisting novel that reads more normal than paranormal despite being filled with merciless, man eating corpses. Don’t get me wrong, the zombies are there and they are scary. Not only can Courtney Summer’s zombies run fast, but they are strong and smart. There was one particular scene in this book that had my mouth dropping open and eyes bugging out because even though I wanted the characters to make it, there was no denying that the zombies had just made a brilliant move. They aren’t the focus of the story however; the focus is Sloane and the other characters because although it’s hard not to think about zombies banging on your door it’s the characters that carry the story. Now almost always, for me to love a story I need to love the characters but in this case I did not like anyone from This is Not a Test, not even Sloane but I did find them all to be realistic and enthralling. I would never want to meet any of them, not even kind hearted Grace or considerate Rhys but all of them kept my eyes glued to the pages and anxious to find out what would happen to each of them. How far would each of them go to survive and what they would do to each other because when it comes down to kill or be killed even the sweetest person can turn into a monster. And some of these characters do some unspeakable things. If you’re looking for a novel with pure action and carnage then this isn’t the book for you, but if you want a book that’s deep, intense, and provocative, a novel that doesn’t gloss over the gritty parts of death or human nature then read This is Not a Test by Courtney Summers because it’ll be exactly what you are looking for. Courtney Summers is honest and up-front about her shizz. Courtney Summers is honest and up-front about her shizz. Her writing is brutal and poetic and cutting, but never once do you feel as if she’s beating around the bush. She writes ON THE REAL. This Is Not a Test by Courtney Summers is all about REAL characterizations, actions, feelings, and issues. Every word is like a brass-knuckled punch to the heart. It exposes you, it wounds you. Each word knocks those pretty rose-colored glasses right off your face and now you’re seeing the world for what it really is—a place gone cold, hellish where only the tiniest glimmers of hope survive to tantalize those struggling to reach for it. I’ve never encountered a writer quite like Summers, a shaper of words so beautiful and impactful that tell the story of a disturbing girl ready to let the world go at the same time it falls apart, crumbles beneath the feet of five other teenagers oblivious to the true meaning of pain, of inescapable imprisonment. Summers’s prose is telling, insightful, and gorgeously dark, uncovering a world in which fate has dealt some a cruel hand. The zombieness? That’s only the HALF of it. They’re thudding and moaning outside the school, sending chills and things down all of our spines, but there aren’t as many close-ups as you might think. AND THAT’S OKAY. If The Breakfast Club had been about kids stuck at school because of ZOMBIES as opposed to detention, it would’ve escalated so fraking much on the coolness scale. Which I had, before This Is Not a Test by Courtney Summers, thought utterly impossible. These characters Summers shoves us into meeting come face-to-face with dizzying suffering and critical, harsh loss in a way no one should. They’re without parents, without hope, without freedom. They are entombed in the school, in their rage, in their agony, in their fear, and are forced to endure the suffocating, maddening reality of it. At the end of the day, each of them want to survive what seems to be the end of all days. Grace, Trace, Harrison, Cary, Sloane, and Rhys? They’re just KIDS, for crying out loud. One character later says something about teenage ingenuity, and that’s EXACTLY it. These six kids manage to escape the zombie population devastating their small town and fortify their hiding place all on their own. The fact that they even came up with the high school on their own? Serious braniac points. God knows I would’ve been slaughtered sometime around page zero on account of my lack of BRAINS, or rather my ability to use them, because the fact that I HAVE THEM and THEY WORK RIGHT is what would drive the zombies bananas for my body. If it wasn’t bad enough that we’re talking about six teenagers stranded at their local high school as they await rescue, there’s all this crazy interpersonal stuff between them. Starting with the fact that the group started as eight. And in between that and the tail end of it is drowning guilt, mourning, suicidal tendencies, and unbelievable loss. Each of these six people have so many emotions locked up inside of them, all these secrets and horrific thoughts, that it’s no wonder there’s so much DRAMA. Although I’m not talking about angsty teen television show drama but HOLY FRAK THERE ARE ZOMBIES OUTSIDE AND PEEPS ARE DEAD, DYING, OR UNDYING EVERYWHERE drama. The sort of bulletin you pay attention to, the sort that keeps you engrossed and appalled and tense all the way through. Ya’ll, some goose-bumpy TERRIFYING things go down in This Is Not a Test by Courtney Summers. And not all of those things are about the zombies gnawing at metal and throwing themselves bodily at all the exits to get inside the building. There’s a lot of bad blood mingling into the group, carrying over more toward the testosterone end of said group. Poor Sloane, who has suffered immense and unimaginable physical and verbal abuse all of her life, is stuck amongst a bunch of loud criers and even louder yellers. The arguments, the punching, the GUN WAVING, all of it, makes for a very tense, be-on-your-guard sort of atmosphere, because every shaky second you have to wonder who’s willing to pull the metaphorical and literal trigger. Who’s crazy and is slowly going crazy, who’s being eaten alive by guilt and by sheer terror. Which is what makes This Is Not a Test by Courtney Summers so thrilling and eerie. Because on the human scope, some of these characters are more vicious than the zombies than they let on. BUT LET’S NOT FORGET ABOUT THE ZOMBIES. Because you will get eaten and ripped apart. And DIE. There are SO many close calls that the shakes take over, the shock, and the panic. It’s not that you’re so close to the characters you feel all this, but Courtney Summers manages to bring you astonishingly strong, perfect images of everything that happens. Then, you’re there, you’re witnessing AND experiencing, which lends the book that much more POWER and DEPTH. I felt closer to the situation than the actual characters some of the time because the imagery was so overpowering. With all this death and decay permeating the plot, you might be wondering, however, how the hell a romance can spark at all? Half of the time, this group seems more insane and twitchy than anything else. The truth is, though, that there’s a lot of emotional depth as well. Sloane and crew have seen and done unspeakably horrible things, which is the reason for all those shadows on the mind and unsaid secrets in the air. Everyone’s once lily-white hands are stained with deep crimson in some haunting way. There’s no going back for the awful things they had, or felt they had, to do. And this is what ties some of the characters closer, knitting them together with blood and devastation and endless remorse. Rhys sure the heck KNOWS something is very wrong with Sloane, whom they stumbled across and enfolded in thinking she was trying to get up as opposed to trying to let go. With a couple suicide attempts under her belt, Rhys is wary and suspicious and angry with this girl he’s always been aware of. What he doesn’t know is that her sister’s escape plan had actually consisted of perfection for ONE and not two, that her father from the time she can remember has beat every ounce of hope and security right out of her. And when he does know these things? There’s softness, gentleness, tenderness, and all those lovely feelings that couple with his protection of her and loyalty to her that make him so subtly swoonworthy. He's hard and serious and guilty of so much, but he’s compassionate and thoughtful too. Sloane may have to wake up on her own, but Rhys is certainly tempting her out of her unnervingly cold and lonely sleep. This Is Not a Test by Courtney Summers is damn near complete and stunning perfection. It’s emotional, tangible, genuine, and beautiful. Each chapter was a shock to the system, constantly keeping me on my toes and taking me by surprise. The story BORDERS on special shelf. But, if there’s one thing I irrevocably dislike, it’s VAGUE ENDINGS. When a book like This Is Not a Test by Courtney Summers is so tormenting and stunning and intense, I feel slightly cheated when I’m not given anything conclusive to hold onto. There’s no clearly defined path, no concrete answer to the big WILL THEY MAKE IT? Will they want to? What now? Granted, this ending is by far one of the better ones in the vague setting, and there IS a hint of closure in what’s written by Sloane on a very important piece of paper she’s carried with her throughout the story that stretches after the last word. I wanted a bit more. With all the expected trappings of a zombie survival novel, Courtney Summers manages to take a concept so familiar to us and twist it so that it’s not the zombies we’re most fearful of but of fellow human beings capable of so much more atrociousness, viciousness than the walking undead who constantly fascinate us. 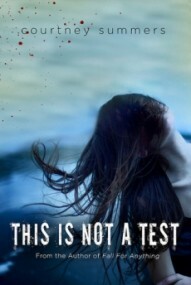 This Is Not a Test by Courtney Summers is more focused on the emotional upheaval caused by and before the zombie epidemic, and the extremes that come with all that packed-in turmoil. Summers invades the mind with horrific scenes and disturbing imagery, all the while maintaining this dark, eerie beauty in the words that make This Is Not a Test by Courtney Summers a story to be experienced and absorbed rather than to be merely read and witnessed. The writing, which has a very particular style, definitely took some getting used to. Even now, I'm not completely sure how I feel about the book or the writing. I think it's probably because it's so beautiful, so nuanced and so gut-wrenching. Her writing also has a strangely lyrical quality, enhanced by the strange placement of punctuation. The world-building in This Is Not a Test is minimal. All we really know is that there was a zombie outbreak, and that's about it. That's because the dystopian aspects aren't what make the book unique, they're not what the book is really about. Whereas most dystopias focus on a person, or group of people, desperate to survive, This Is Not a Test focuses on a girl who wants to die. This viewpoint really changed everything. What scares Sloane is not the zombies, not the dying. She fears having to live. I've seen this book called "The Breakfast Club meets The Walking Dead." I see where they're going with that, and it's valid. I want to add a comparison to Laurie Halse Anderson and Ilsa J. Bick. If you enjoy those authors, you will love this, and by love I mean be seriously depressed by. I think this one is going to stick with me.